That's me, resting against the sign atop Imogene Pass. I traded a young couple in a jeep--I took their picture, then they took mine. I had trouble with Imogene Pass last summer. One steep spot required three tries, and when I did make it there wasn’t much grace involved. Even though a year has made a difference in my skills, plus I have better tires now, I’ve been putting this particular pass off. But on Friday, August 20, 2010, I gave it a go. I should state up front that this is a 4WD road, meaning Jeeps, ATVs, and motorcycles (or hiking or horseback). One accesses Imogene Pass from the Ouray Side by going up toward Yankee Boy Basin (for details, see here). The GPS track in this post (at the bottom of the post) takes off from Camp Bird. 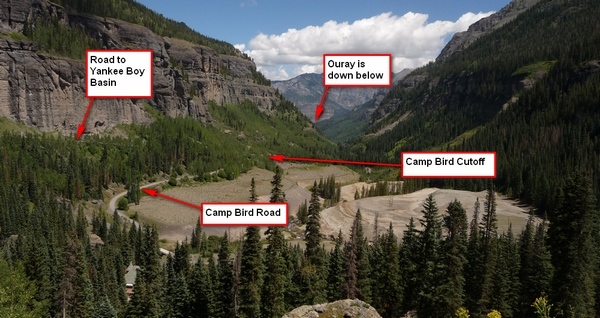 There’s always been a private cutoff through Camp Bird, but this year it’s open to the public. The following photo shows how to find it. 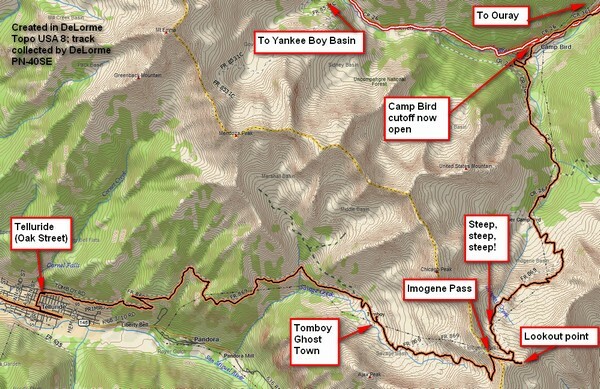 Instead of following the road straight up toward Yankee Boy Basin, take the cutoff shown in the picture. Yes, there's a road there, it just slopes gently down for awhile. The portable toilets have been there for some time, so you might be able to use them as a landmark, provided nobody moves them. The best landmark is the scenery behind. The Camp Bird Road runs up through some old houses that were used as part of the mining activities. Interesting old building on the Camp Bird property. Note the fences intended to keep you on the road. These are private buildings, not open to the public. Whew! In only a few short yards, look how high up you are. Yep, the road is steep. This looks back down the canyon in the direction of Ouray. The road soon joins up with the “main” road to Imogene. (Don’t blink, or you’ll miss the intersection!) The road levels out for awhile and then heads up into the basin. There are parts with some serious scree, but at first not too steep. You’ll have to ford the creek a couple times. Toward the top the road dips down for perhaps twenty yards, and then climbs a steep section. This is where I had trouble last year. This year I picked a nice line and went up with only one minor problem, and that is at one particular little bump, it was all—and I mean all—my little 250 cc engine could do to keep up. If that section had been five feet longer I think my engine would have stalled. Next time I’ll find a path that doesn’t include that particular steep part. After more climbing, thankfully nowhere nearly as steeply, you come to an intersection. The viewpoint is to the left (east) and the pass itself is to the right (west). The viewpoint offers spectacular views. This looks back, generally north, down into Imogene Basin, which I had just climbed. You can barely make out the road coming up through the middle. From the Imogene viewpoint, looking generally east. The red arrow points to Corkscrew Gulch Road just as it makes its final climb to Corkscrew Pass. The picture of me at the summit is at the top of this post. If it looks like I’m hanging onto that sign, you’re right. I worked hard to ensure a smooth passage up the steep, moderately scree-strewn road, plus that sign tells you that I’m at 13,114 feet above sea level! The road down is steep and features some scree, but is mostly in pretty good shape. I don’t like to whiz down roads unless I can see really far ahead and know it’s mostly a straight line, plus I have a run-out at the bottom. I could see plenty far, but the tight switchbacks didn’t offer much in the way of run-outs, so I took my time. The road winds through the Tomboy Ghost Town, which is very poorly maintained. It appears no preservation or “arrested decay” work has been done on any of the structures. I have quite a number of pictures of Tomboy and have put them into a separate post here. The road continues to wind down the hillside. One spectacular view looks back to the southeast to see Black Bear Pass Road. Yes, it’s every bit as steep as it looks. Yes, Black Bear Pass is every bit as steep and trecherous as it looks. It's two-way up to Bridalveil falls, but after that it's only open to traffic coming down. Those wishing to traverse the entire road enter near Red Mountain Pass--again, the road is two-way until it gets to the hard part. The hard part is considered expert-only. I advise staying away from Black Bear Pass Road. Not much further on, we get our first view of Telluride, nestled down in the bottom of the canyon. You’ll note that Telluride is tightly surrounded by green space on all sides. That means it can’t expand. That also means real estate is more valuable. A tiny house on a narrow lot can cost well over a million dollars. Lots of money here! One last photo prior to the GPS track. This photo shows the entry to Imogene Pass Road from Oak Street. Is is not marked. At all. There are no signs even hinting this road has anything to do with Imogene Pass. Further, Oak Street doesn’t even run all the way down to the main drag. And on the main drag there are no signs—repeat, no signs—telling you where to head up the hill. Further, as one comes down the road from the pass, there are signs saying that ATVs and unlicensed motorcycles need to turn around and go back over the pass. There’s no parking area for someone with a trailer to pick up unlicensed vehicles. 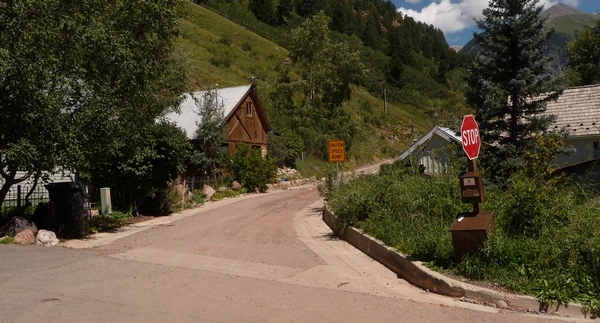 Do you get the idea the good (rich) folks of Telluride don’t want tourist traffic through here? But now you know just how to access it from the Telluride side! The Telluride entrance to the Imogene Pass Road is well-hidden. There are no signs of any kind. It's found at the north end of Oak Street. Note that Oak Street does not go all the way down to the main drag. Here’s the GPS track. I think it’s probably pretty accurate, though I’ve noticed sometimes an error of as much as several hundred feet in deep canyons, and the Imogene Road certainly travels through deep canyons! GPS track of my trip from Camp Bird (which is accessed from Ouray as noted in another post) up over the pass and down into Telluride. I'll have a separate post on the Tomboy Ghost Town. This entry was posted in GPS Tracks, Motorcycling, Ouray County, San Miguel County. Bookmark the permalink. Thanx for feedback guys. Just came back from a trip in one piece. What an amazing adventure it was, we hit all the trails and 550 Hwy to connect to other trails/fire roads. Bike was running like crap on high altitude though, had to spend most of the day in 1-2 gears unless we go lower in altitude and then it was fine. As of going from Black Bears Pass to Imogene pass we rolled a dice and we were fine. It was during weekday though, maybe on weekend we wouldn’t be so lucky. We even stopped to get food in Telluride and then jumped back on bikes. Imogene pass tool longer than expected and we came back to Ouray around 9 pm, and straight to hot springs. It was one epic trip. What amazed me is that most people were running dirtbikes with no lights or plates on Ouray streets and up to Hwy550. And I haven’t seen a single cop or ranger during my stay. Amazing place to ride and amazing state to live. I would definitely do it again but next time on 4stroke and street legal bike to avoid headaches of getting pulled over though. You would be fine on Black Bear pass but there is no good way from there to the start of Imogene on a non street legal vehicle. I would not chance it in Telluride. Unless you don’t mind a couple hundred dollar ticket. There are even signs that state you need to arrange for pickup in Telluride before the one way starts. Everywhere else in that region they’re cool about OHVs on the road but Telluride are sticklers. They’ll ticket you for a couple over the speed limit in a heartbeat so I’d watch it. There is no connection for unlicensed vehicles between the west (bottom) end of Black Bear Pass and the west end of the Imogene Pass road. The folks in Telluride are not really supportive of off-road vehicles. If your bike is street-legal, you’re good to go. If not, there really aren’t any side roads to take. Such a route has been proposed but Telluride voters keep rejecting it. Regarding a KTM 200, given it’s a two-stroke, it may be okay. My Yamaha XT-250 was a four-stroke, and it barely made it over the pass because of the steepness and altitude combined. Note that “jetted for the altitude” needs to cover from 7500 feet in Ouray to 13,114 feet atop Imogene. Note that Black Bear Pass road is one-way, west-bound (down), from the top of the cliff to nearly the bottom, so there’s no way to change your mind and go back. The road has its fearsome reputation for a reason. Mother Nature is extremely unforgiving. Good luck! 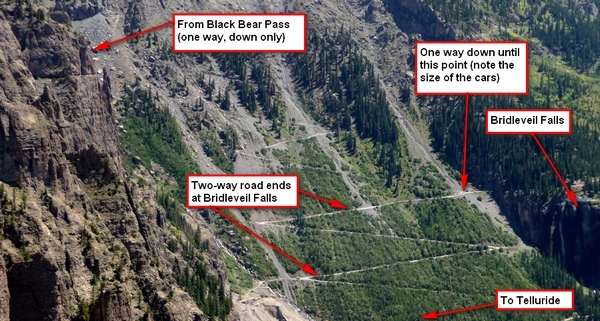 Question: planning to go on a dirtbike from Ouray to Telluride and Back to Ouray, Will be going though Black bears pass. How many cops have you seen on a Black Bears Pass or around that area in general? I wonder if I will be able to get away with going through side street through Telluride to Tomboy Rd and then Imogene pass. Bike has light and mirrors and insurance, and plate but it is registered as an off-road vehicle in other province. Do you know rough distance from Ouray to Telluride through Imogene pass? ( sorry didn’t see it in your write). Also do you think KTM 200 2-stroke jetted for high altitude be able to handle this ride? Thanks Dave! Bike is already rejetted and ready to go. Love your website and details about the trails. Thank you! Hi Doug. Your 400 will likely provide you with ample power for the steep parts. I rode a 250cc bike, and between my weight, >200 lbs, and the altitude, 13,000 feet, I was at the limit of what my machine could do. But with those extra 150cc, I suspect it’ll be easy. Note that if you’re bike is carbureted, you may have to rejet for the altitude – talk to your dealer. Once you are in Telluride, you have a couple choices. Last Dollar Road will bring you over to Dallas Divide. Also, you could go over Ophir Pass to get back to US 550. Ophir Pass is actually an easy road, although there are some spectacular drop-offs as you cross the rockfall! Good luck with your trip! Just how steep is “Steep, Steep, Steep!”? Will be there next week and will go from Ouray to Telluride. Very much looking forward to it, but that caption scares me a little 🙂 Will be on a street legal KTM 400. Also, is there a good trail to take back to Ouray/Ridgeway without going back the same way? Thanks for your time! Hi Mike, the road is very rough, which your Tahoe can handle, but also very narrow, which would make it hard for the Tahoe. The issue is oncoming traffic, especially on the narrow section just west of Tomboy. There just isn’t room for a full-sized pickup unless you have the road absolutely to yourself, which you won’t this time of year. My suggestion would be to rent a Jeep for the ride. The duration of the ride depends on many factors, including weather and oncoming traffic. You probably won’t be traveling much more than 5 mph over the rough spots, perhaps even less, but there are other spots where you can get all the way up to the 15 mph speed limit. Plan on several hours. Good luck with your trip and welcome to Southwestern Colorado! I am going to be in Telluride for a few weeks in July. I have a Tahoe that I have done a fair amount of trail driving in New Mexico. Is there any reason that I wouldn’t be able to handle this trail ? Is this a 3 hour ride one way ? Our family just comeeptld the journey from Ouray to Telluride via Imogene Pass yesterday afternoon. It was a very beautiful and remarkable trip! We loved every minute of it! We were told before we left Ouray that the trail, or at least part of it was a one way trail and you could only go from Ouray to Telluride and that you could not go the opposite direction. Looking today online I am not finding any such information and am just wondering if you know anything about this. We didn’t have a camera yesterday as we did the trip spontaneously so we are hoping to do it again soon. However there are parts of the trail where there is no way two vehicles could fit. I would like to know if it is one way before I take my children on the trail again. Thanks!! wow… coming out to ouray in july & wanting to go up to yankee boy… just clicked on your photo and saw your name dave casler don’t see that name too often. looks like a great time, would appreciate any info you can give me about local conditions in july. Lynn, the answer is yes and no. You can certainly ride your ATV from the Ouray side up and over Imogene Pass and part way down to Telluride. But ATVs are restricted from going all the way into Telluride, so you’ll have to turn around and go back the way you came. I was able to do the loop (Imogene, then Ophir) only because my motorcycle is street legal. There is no place on the Telluride side for someone to pick your ATV up and trailer you to another pass. In Ouray County, ATVs are allowed on unpaved roads, but there are no loops that you can complete without needing to use an unpaved road. I have done engineer and cinammon pass loop from Animas Forks to Lake City and back a few years ago on ATV’s. This summer I am planning on Imogene from Ouray to Telluride or vice versa; Is it possible to go and make it back in one day on ATV’s without taking Black Bear Pass? Sounds like you had a great trip. Perhaps we passed each other—I had quite the trip yesterday, part of which was Imogene from Telluride to Ouray. Indeed it is a two-way road and I have traveled it both directions. Note that the vehicle traveling uphill has the right of way, though the authorities urge the use of common sense. (The motorcycle, of course, can get by nearly anything, whereas a Jeep is rather harder sometimes.) When traveling downhill, look well ahead and if you see vehicles coming up, find a place to pull aside until they pass. Similarly, if you’re going uphill and a downhill vehicle has no obvious place to pull over, wait for him to pass before going up the hill. The pass which has a one-way section is Black Bear Pass, a road reserved for experts only—I don’t consider my skills good enough to try it. Our family just completed the journey from Ouray to Telluride via Imogene Pass yesterday afternoon. It was a very beautiful and remarkable trip! We loved every minute of it! We were told before we left Ouray that the trail, or at least part of it was a one way trail and you could only go from Ouray to Telluride and that you could not go the opposite direction. Looking today online I am not finding any such information and am just wondering if you know anything about this. We didn’t have a camera yesterday as we did the trip spontaneously so we are hoping to do it again soon. However there are parts of the trail where there is no way two vehicles could fit. I would like to know if it is one way before I take my children on the trail again. Thanks! !